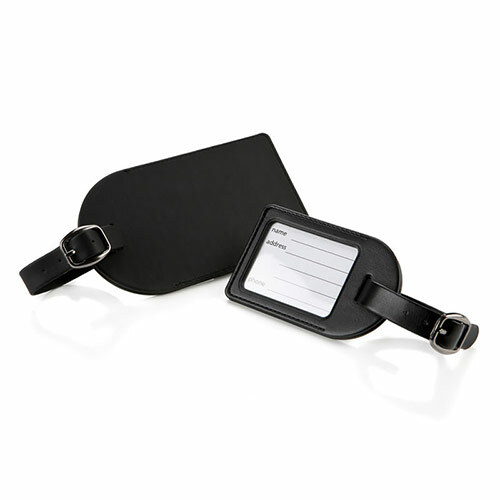 Classic leather luggage tag crafted in black soft-touch Belluno leather with stitched edges and a window for a white printed name and address card. The window is protected by a clear plastic sleeve. The tag attaches to luggage with an adjustable leather strap with chromed buckle. These stylish luggage tags can be customised by laser engraving directly into the leather, a process that leaves a clean, crisp and very distinctive mark for your name, logo or message. When customised, these tags are perfect as promotional items or corporate gifts.